Judge Curtis "Lane" Porter was appointed on June 9, 2016 by Gov. 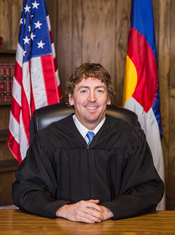 John Hickenlooper to serve as County Court Judge for Prowers County in the 15th Judicial District effective July 1, 2016. Judge Porter earned his undergraduate degree from the University of Colorado in 2005, and his Juris Doctorate from the Brandeis School of Law at the University of Louisville in 2008. He has served as a Deputy District Attorney in the 15th Judicial District since 2009.